We’re fortunate to have so many allies in our mission to bring fresh food to pets everywhere. These men and women are behind the rescue centers, non-profit organizations, foster homes and other organizations. They are just as dedicated as we are and do wonderful things every day simply because they love pets. And we want to recognize these men and women for the wonderful work that they do. In this week’s Act of Kindness we introduce you to a very special rescue organization: Greytful Hearts Greyhound Rescue. Paula and her husband Erik have been greyhound lovers for the past 21 years. Their love for the dogs has been such a big part of their lives that they founded their own rescue organization in 2010: Greytful Hearts Greyhound Rescue, located in Hamburg, PA, and dedicated the group to the memory of Flo, their very first greyhound. Their goal is to place retired ex-racing greyhounds into permanent, loving homes. In addition to having 8 greyhounds of their own, Paula and Erik can foster anywhere between 2-6 foster dogs in their own home! Their dedication to their greyhounds is really incredible. 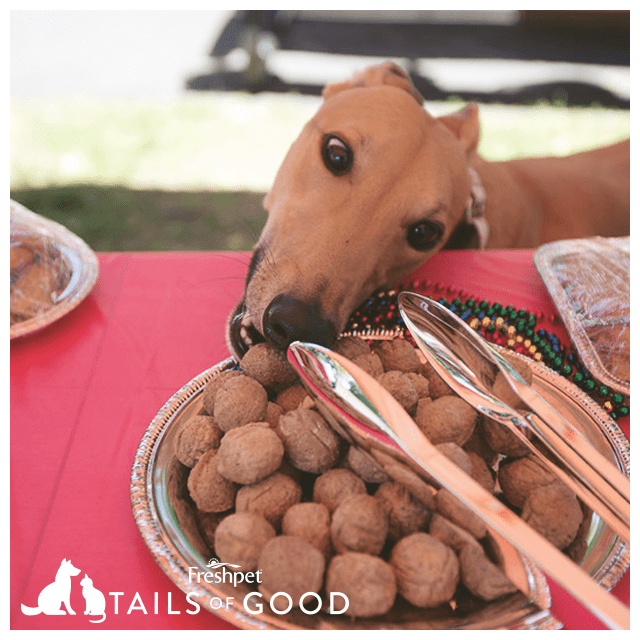 Greytful Hearts has always been a wonderful friend to Freshpet, and they love to feed their dogs our recipes. Currently, the favorite in the house has been our Vital Grain Free Beef and Bison rolls. Which the greyhounds have been eating right up! This past June, Paula and Erik decided to throw a little “family reunion” for the greyhounds they have at home and the ones that had been adopted. It was a fun-filled picnic, held in Bubeck Park in nearby Schuylkill Haven. Food and drinks for the humans were served. And as for the dogs? We donated a catering platter of our Meatball Mix-ins and Ready-to-Bake Cookies for them to enjoy. As you can see from the picture, Hudson couldn’t wait to get his paws on the food. The party itself was a hit. All the parents and pups loved reuniting during a beautiful afternoon, and by the end there was hardly any food to spare. Paula and Erik are already planning the next reunion! If you know of a pet or family member who deserves an Act of Kindness, we want to hear from you! Email us at [email protected], or send us a message on Facebook or Twitter.